I have three cousins who have had their DNA tested. Three cousins who match me (thank goodness). Three completely different amounts of DNA passed down. How is that possible? Recombination. My three cousins and I have all taken autosomal DNA tests. As I understand it, although everyone who descends from a specific ancestor carries that person’s DNA, not everyone carries it on the same chromosomes or carries the same amount on the same chromosomes. That is called recombination. With each generation, the DNA reformulates. I get a piece from our great great grandfather, my great grandmother, my grandfather, my mother. You get a piece from our great great grandfather, your great grandmother, your grandmother, and your father. While pieces of the original DNA from our shared great great grandfather are still present, it’s mutated, so to speak, by the time it has gotten to you and me. This is measured in cM or centiMorgans. These are my three cousins. Tom comes from my Welsh/Irish side (maternal, maternal, maternal) and Lori comes from my Azorean side (maternal, paternal, paternal). They are both my third cousins. Lillian and I are from different generations. We are second cousins, once removed. She also comes from my Azorean side, but through my great grandmother not my great grandfather (maternal, paternal, maternal). You would think that I would share about the same amount of combined centiMorgans with Tom and Lori because we are in the same generation. And, because Lillian and I are in different generations you would think we’d share even less. At least I would. Cousin Lori shares 1 large block with me. I have to push the meter down to 3 cM to see the other two blocks that we share. Cousin Lillian shares the most DNA with me. We share two large blocks: One on chromosome 15 is 43.8 cM and one on chromosome 19 is 36.4. We also share a block on the X chromosome, though I confess that I don’t know how to utilize this information. Doesn’t it stand to reason that though we descend from different lines, but are related to the same degree, that we would have equal amounts of DNA shared? The simple explanation is what Cheri Mello of the Azores DNA Project at FTDNA explained to me: It’s about quality as well as quantity. While Lillian and I shared a couple larger blocks on different chromosomes, Lori and I share only one equally sized block. A big old blob of Azorean DNA. But notice, that one block of cM on chromosome 2 is 25 cM. That is almost the same size as my largest block with Tom (30 cM). That is the quality of one block over the quantity of many blocks added together. In this example, let’s take two people who share a combined 60 cM, but they share small blocks of 10 cM or less. This relationship is going to be farther back than someone, like Lori, who only shares 41 cM total with me, but has most of those centiMorgans in one larger block (25 cM). It is complex. There are going to be exceptions because of recombination. 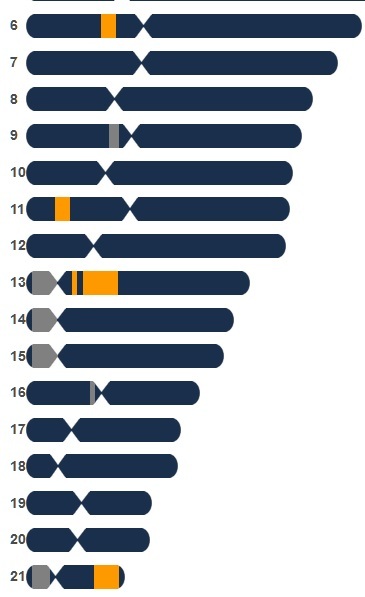 Now that I understand this, I understand why FTDNA might say that one cousin who I share 60 cMs with is in the 2nd to 4th range and another is 3rd to 5th or even 4th to remote. And remember, those cousin ranges are estimates. Lori and I knew our relationship prior to DNA testing. There is no doubt that we are 3rd cousins. FTDNA estimated us as 3rd to 5th. 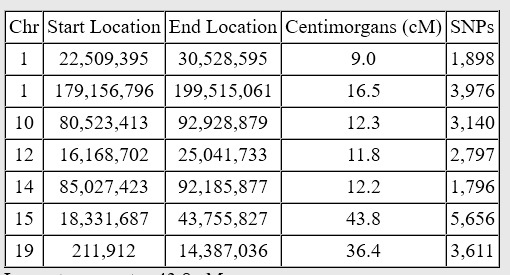 Someone else who has the exact same amount of shared centiMorgans may be my 5th cousin. A large block usually beats several smaller blocks adding up to the same amount. I am still learning. DNA research is complex and it takes some time to make sense of it all. I have found the book “Genetic Genealogy: The Basics and Beyond” quite helpful. The DNA Explained website provides helpful information and resources pertaining to a better understanding of genetic genealogy. The Beginners Guide to Genetic Genealogy is a great tutorial for learning basic as well as advanced topics. The Legal Genealogist regularly posts informative articles related to genetic genealogy. You can find them under the DNA category on Judy Russell’s website. Michael, Thanks for your comments! I also appreciate the links. I am familiar with the DNAeXplained website, but not the others. There really is quite a bit to learn with genetic genealogy.